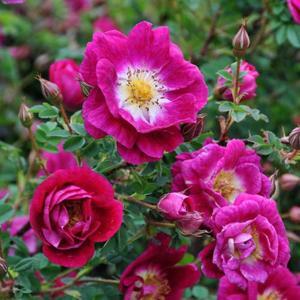 Clusters of small rounded semi-double flowers, rich purplish magenta-pink in early summer, fading to soft cerise. Dense bushy foliage with small leaves. Black or dark browish hips in autumn. Can be easily propagated by separating and planting the frequently produced suckers.